Interviewer: Jang Keun Suk will release his 3rd album Monochrome in Japan where he debuted 5 years ago. The third album departs significantly from his past work in terms of lyrics and rich green imagery. Let’s see what his comments are from our in-depth interview. JKS : Do you think this album is really different from my past works? Interviewer: It is very different. JKS: My past two albums have distinctive qualities to them from the look of the cover and title to the composition of the songs, this album departs from them. Interviewer: Yes, for that reason I would like to start the interview discussing where the change originated. JKS: You know them well (laughs) and my new album “Monochrome” as the name implies sets the image completely. From the image and color changes of the three albums, I think it shows a maturing Jang Keun Suk. Interviewer: Mature? Jang Keun Suk grows up, is that what you mean? Interviewer: Yes, that’s correct, I think you have grown, matured, I can’t say I was certain…now I think you have. As I understand you’ve tried to express the true essence of the current Jang Keun Suk in this album. So when you were thinking about what to include in this album, did you included aspects of your own life in the theme and songs? JKS: Aside from the visual image Monochrome imparts, it also reveals the human being/man, Jang Keun Suk, does that make sense? I think that there is a deeper meaning in this album. While the messages of the previous albums were “Let’s play with me! Let’s party.” this shows a side never seen before. For the album Monochrome I wanted to express what’s on my mind…can you read my thoughts and know my story? The same can be said about showing my heart. JKS: Obviously my two previous albums have different qualities/aspects to them. For Monochrome is it an “Intimate portrait of Jang Keun Suk” that’s why the album represents me. Interviewer: When I first heard the album, I was really surprised. It is clearly not an album done lightly, it does have a playful quality to it but Jang Keun Suk also laments and worries about things. JKS: Ah ha ha ha. It does have a serious tone, however to be more precise, it’s a little different than that. Honestly, it evolved through the creative process and is not the point in which the piece/album is focused on. But surprisingly, I can understand it. The producers were initially confused when the theme was introduced. Interviewer: Is the producer Mr. Choi Cheol-Ho as usual? JKS: Yes, he looked like a frightened child at the beginning thinking “Is the color/image of the next album going to red?” and had an apprehensive expression (laughs). As we started comments such as “You could include aspects of your life to give it a more personal touch” emerges and slowly everything fell into place. In reality to create this album I had to discipline myself and race against time. So at the beginning Mr. Choi’s response was, “I don’t know” (about completing the album on time). JKS: Hmm... It concerned a relationship in study after I graduated from college. Interviewer: Oh? A year ago Mr. Keun-Suk was in college? JKS: Yes, (laughs) I am going to graduate school now. Since last year I started to live on my own, but that’s not important. In Korean calendar, this January, I am 29 years old. Only in the Gregorian calendar I am 27 years old. I am approaching 30 and if I mature, grow more I do not mind. There is no doubt. Interviewer: Don’t you think it’s a new untried album? How anxious are you about it? JKS: There are many fans who want to see the same bright Jang Keun Suk as before. But if I always show the same persona, you will not get to know the evolving real Jang Keun Suk. Interviewer: This album is made specifically for Japan and I think that’s one of the great features of Monochrome. JKS: That was a very important factor and it was very difficult (laughs). Interviewer: You do not refrain from singing many songs entirely in Japanese. JKS: Thanks to a Japanese lyricist who did her best from the beginning. Interviewer: So the lyrics were first written in Korean and it was used as a base when writing the Japanese lyrics? JKS: That is how it was done for my previous works. This time the lyrics were written in Japanese from the beginning. JKS: Singing is a form of expressing the beauty of God/the universe. I just wanted to encourage everyone to live harmoniously in the world. JKS: There are certain unique words in Japanese that are used to express specific emotions. By using those words, I wanted to appeal to the hearts of those listening to the song. That’s why the Japanese lyricist was able to better convey the full meaning of the songs with those words. Interviewer: There are multiple perspectives, not just a rosy view of the world when creating the songs, would you say that? JKS: How should I say this…you want to know if it comes close to how it feels like when I am working on dramas or movies. No, surprisingly there is little similarity. I want to convey my feeling as best as possible whether it’s on the stage or the through the words written by a professional lyricist. As a result, I can express my intimate thoughts and feelings more clearly. JKS: Of course, I worked with the lyricists several times to fine-tune the words. Somehow there were not many opportunities for me to work with the producers in Japan in person once the ideas were developed in Korea, that’s why we often corresponded through letters. Interviewer: So, somehow you were able to establish the theme. JKS: Because I would start a song inspired by God. When it comes to expressing an emotion, I would be very conscious of how I should sing it. For example, when I see the word “굿럭” in the lyrics, I would refer back to another song with the English pronunciation. Interviewer: Come to think of it, I have heard the song called “Road race” on the radio. JKS: Yes! That is the plan so far, it will be aired on the radio, but are we supposed to talk about katakana카타카. Interviewer: Tell me about the lead single “Hidamari” (sunny spot/sunshine), your feelings about this song. JKS: The song is full of warmth with a message of hope that is very different from the cold image of the cover. Interviewer: The song has a very soft warm sunny feel to it. JKS: The words were etched onto my heart ever since I heard it for the first time and I have embraced it completely. The melody is catchy and during a live concert everyone will be able to sing along easily. Interviewer: So listening to the song live would greatly enhance its enjoyment. JKS: Initially “Hidamari” was not going to be the lead single, “Fragile as Snow” was slated to be the lead single. But once the recording session of “Hidamari” ended, the staff said “This is good and should be the lead single” so we unanimously decided to make the change. Interviewer: “Pale as snow” represents a winter harried love song and “Hidamari” a warm enduring love song. JKS: It’s the foundation, I think this song has the same feelings as my past two albums so it was fitting it became the lead single. Interviewer: It’s one of the unique qualities of Jang Keun Suk (laughs), well, love is depicted here but it is a forbidden love. JKS: Yes, you are not supposed to love. Depending on how the listener will interpret it. Interviewer: “Before dawn,” “Road race” and “Towards the sunlight,” these three songs are lively. JKS: Because of the fast tempo. JKS: It’s really hard (laughs) compare to a short song with fewer words, I have suffered much. With an upbeat song like “Road race” I was able to finish the recording session quickly. I sang from my heart with sincerity to make the melodies and composition more vibrant. Interviewer: “Let’s go home” is a soothing acoustic piece that is the last song on your album. JKS: It’s a confession I made to myself. The song has a feeling of self-reflection. Previously I was not able to stop and contemplate. Just last year I asked “Why did I ran all the way here?” If you ever asked yourself that question, this song represents that sentiment. JKS: Everyone needs that momentary break, a time to reflect and grow. I think a new world of possibilities will open up as you start over again. Monochrome is an album that is very meaningful to me and will continue to be so until the day I die. Thank you so much for the translation! It was really fast! Always love his interviews. I have listened to the preview of the album many many times, love all the songs. I didn´t know he was involved so much in writing the lyrics. Hope we can read the lyrics in english eventually. Can´t wait my Monochrome. Love JKS. Thank you for the translation once again. ◘ Interviewer: “Pale as snow” represents a winter harried love song and “Hidamari” a warm enduring love song. ►JKS: It’s the foundation, I THINK THIS SONG HAS THE SAME FEELINGS AS MY PAST TWO ALBUMS SO IT WAS FITTING IT BECAME THE LEAD SINGLE. ◘Interviewer: The romantic words are also part of the reason. 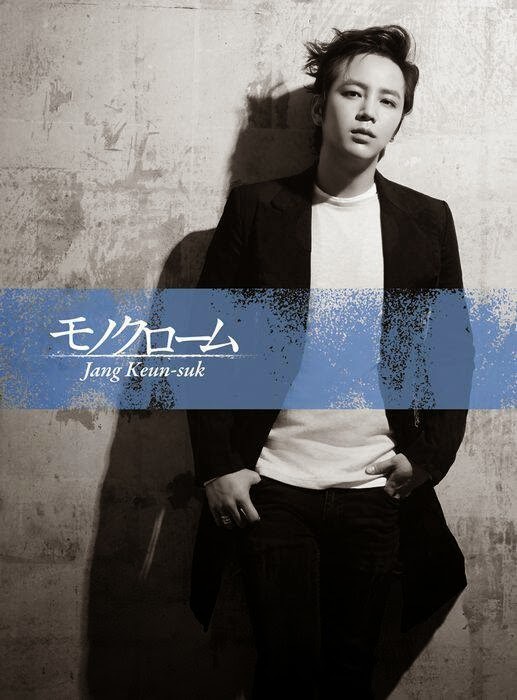 ►JKS: But the soft and melancholy songs like “Pale as snow” makes this album distinctive. Do you not sense an enduring and strong presence? VERY FEW PEOPLE EVEN MYSELF KNOWS WHAT IT REPRESENTS (laughs). ◘Interviewer: It’s one of the unique qualities of Jang Keun Suk (laughs), well, love is depicted here but IT IS A FORBIDDEN LOVE. ►JKS: YES, YOU ARE NOT SUPPOSED TO LOVE. correction of "AFTER" to "BEFORE". ERROR: JKS: Hmm... It concerned a relationship I had for a year AFTER I graduated from college. CORRECT: JKS: Hmm... It concerned a relationship I had for a year BEFOREI graduated from college. thanks you very much, you're the best. Dear friend, all of us, the TEF translators team wanna say THANK YOU SO MUCH TO YOU for appreciating our really hard work and efforts. All we do is for him, to show him that his eels are able to do everything is needed to support him. Again, THANKS FOR FOLLOWING AND HELPING US !!!!!! Anonymous,thanks for the correction, is very difficult translate this kind of interviews when you don t know a lot japanese or korean,,so we appreciate your help . Thank you very much.We changed already,by Esther Noloc.